On Jan. 25, 1915, After 40 years since he introduced the telephone to the world, in 1875, inventor Alexander Graham Bell spoke with Thomas Watson, 3400 miles away in San Francisco, making the first transcontinental phone call in history. 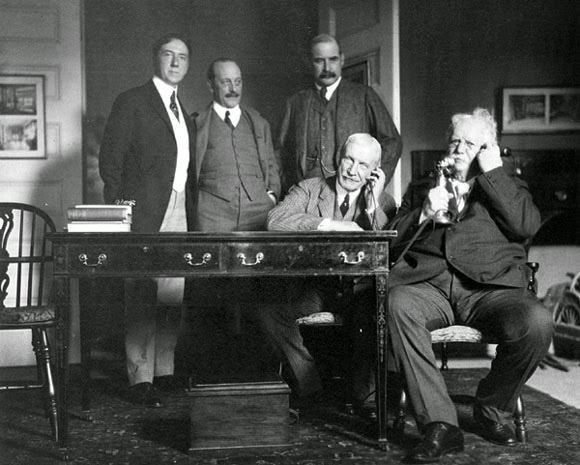 On October 9, 1876, Alexander Graham Bell and Thomas A. Watson talked by telephone to each other over a two-mile wire stretched between Cambridge and Boston. It was the first wire conversation ever held. Yesterday afternoon the same two men talked by telephone to each other over a 3,400-mile wire between New York and San Francisco. Dr. Bell, the veteran inventor of the telephone, was in New York, and Mr. Watson, his former associate, was on the other side of the continent. They heard each other much more distinctly than they did in their first talk thirty-eight years ago. The record for long-distance talking was established last night when Theodore N. Vail, President of the American Telephone and Telegraph Company, on Jekyl Island, talked by way of Boston to Mr. Watson in San Francisco, the wire being stretched 4,750 miles. In the afternoon Mr. Vail had talked to Mr. Watson through New York, a distance of 4,300 miles. VoIP IP Telephony. Powered by Blogger.